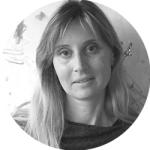 Rita Popowicz has been working in the art industry since 1994 and has lived in Switzerland, Hong Kong, Israel, and the U.S. She earned a business degree in Switzerland and an art history degree in the U.S. Popowicz has worked for Christie’s in Zurich and has been involved in organizing art fairs since 1996. It is her passion for art, languages, and travel that keeps her in this industry. Outside the office, Popowicz loves spending time with her family. They are always on an adventure, whether traveling, playing sports, or simply hiking and camping in the desert. She follows her dreams and encourages others to do the same.